NEW ORLEANS — Recent history suggests the balance of power in women’s collegiate track & field primarily rests in one conference (SEC) and one location (Eugene, Oregon). Oregon has won seven NCAA team titles in the past seven years (six of the past seven indoors and one outdoors) and if it’s not the Ducks, it’s the SEC (Arkansas with the 2015 indoor crown and 2016 outdoor crown; Texas A&M with the 2014 outdoor title). 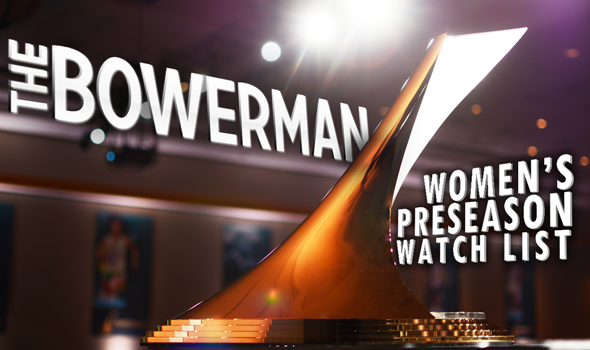 It’s only right that the Preseason Watch List for the women’s version of The Bowerman Award is dominated by athletes from Oregon as well as the SEC. In fact, six of the 10 women on the Preseason Watch List are from the SEC and three Ducks flew together. Quanesha Burks JR Alabama Sprints/Jumps Hartselle, Ala.
Jasmine Camacho-Quinn RS SO Kentucky Hurdles North Charleston, S.C.
Molly Seidel SR Notre Dame Distance Hartland, Wis.
Lexi Weeks SO Arkansas Pole Vault Cabot, Ark. Also Receiving Votes: Hannah Cunliffe (Oregon); Teahna Daniels (Texas); Karissa Schweizer (Missouri). Two of the women on the Preseason Watch Lists were finalists in 2016: Georgia’s Keturah Orji and Mississippi’s Raven Saunders. Orji and Saunders were more than qualified to win The Bowerman Award, but the 35-pound trophy ultimately went to Texas 400-meter specialist Courtney Okolo. The seasons Orji and Saunders had in 2016 were well-documented and packed with NCAA titles, records and trips to the 2016 Rio Olympic Games. Orji swept the indoor-outdoor triple jump crowns and set a collegiate and an American record in the event at the 2016 NCAA Division I Outdoor Track & Field Championships. She was then crowned the U.S. champion at the Olympic Trials and finished fourth by a hair at the Olympics where she bettered her American record to 14.71m (48-3¼). Saunders broke the indoor and outdoor collegiate records in the shot put (the latter of which stood for 33 years before she took it down) and won the outdoor title in Eugene. She qualified for the Olympics in the event and then placed fifth there when she heaved the shot 19.35m (63-6) to improve her all-dates collegiate record. Two other semifinalists from 2016 — in addition to Orji and Saunders — are on the Preseason Watch List: Oregon’s Ariana Washington and Georgia’s Kendell Williams. Washington burst onto the scene at the 2016 NCAA Division I Outdoor Track & Field Championships when she became the first freshman to sweep the 100- and 200-meter titles and the first woman to do so since 2003. Williams is a two-time semifinalist for The Bowerman Award and captured both combined event crowns in 2016. During the indoor season Williams won her third consecutive pentathlon title and increased her collegiate record total to 4703. Those four names — Orji, Saunders, Washington and Williams — take care of three SEC athletes and one Duck. What about the rest? Well, the three remaining athletes from the SEC are Alabama sprinter-jumper Quanesha Burks, Kentucky hurdler Jasmine Camacho-Quinn and Arkansas pole vaulter Lexi Weeks. Burks is the defending NCAA champ in the indoor long jump and finished runner-up outdoors. Camacho-Quinn won the outdoor crown in the 100 hurdles — becoming the first freshman in NCAA history to do so — and placed eighth in the 200 meters. She went on to compete at the 2016 Rio Olympic Games. Weeks, who became the fifth woman in collegiate history to join the 15-foot club, swept the indoor and outdoor NCAA titles in the pole vault. She then placed third at the U.S. Olympic Trials to earn a spot on the U.S. Olympic Team. Raevyn Rogers and Deajah Stevens are the other athletes from Oregon on the Preseason Watch List. Rogers swept the 800-meter slate clean in 2016 and ran the second fastest time in collegiate history indoors (2:00.9) at the NYRR Millrose Games. Stevens finished runner-up to Washington in the outdoor 200 and took fourth in the indoor 200. Second place didn’t bother Stevens a few weeks later as she qualified for the Olympics and then in Rio, she finished seventh in the 200-meter final. The only athlete on the Preseason Watch List not to be from the SEC or Oregon is Notre Dame’s Molly Seidel, who returns to handle some unfinished business. Seidel was in a great position to sweep the indoor-outdoor distance crowns after winning both the 3000 and 5000 indoors, but an injury kept her off the track outdoors. Also receiving votes were Oregon’s Hannah Cunliffe, Texas’ Teahna Daniels and Missouri’s Karissa Schweizer. It should be noted that Okolo started the 2016 season in this category and went on to win The Bowerman Award in December.